Why would neither the CBC nor the Globe and other sources at least mention that Kasab has already confessed to the attacks and retracted the confession, as reported by AFP, alleging he was tortured and coerced into it? In the article below, Kasab now denies any coercion. Another anomaly, newly reported on by the Globe, was that after landing in India, they met an Indian handler named Abu Zundal. All of which seems to point to this group having been patsies in an operation coordinated between the ISI, CIA, and Indian agents. Perhaps this has now dawned on Kasab, who would then be looking forward to either extradition (based on Pakistan claiming his citizenship) or a quick death. Update (2009/07/21): The content of the confession (which reportedly includes details of the indoctrination received at the hands of LET in Pakistan) has now been sealed by the court, which has deferred its decision on whether to accept it or not. The only suspected gunman to survive November’s deadly Mumbai attacks has pleaded guilty in Indian court, a move that comes despite numerous denials in recent months. Mohammed Ajmal Kasab is charged with 86 criminal counts, including murder and waging war against India. 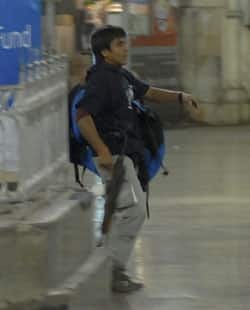 Kasab stood up during his trial at a special court set up to try him and addressed the judge Monday. “Sir, I plead guilty to my crime,” he said. Judge M.L. Tahiliyani, who appeared to be taken aback by the statement, called lawyers from both sides to figure out its significance. Prosecutors allege Kasab is one of 10 gunmen involved in November’s Mumbai attacks, in which about 166 people were killed, including two Canadians, and at least 234 were wounded. Nine of the gunman were killed during the siege. In May, Kasab pleaded not guilty to 86 charges against him. Kasab also gave the court details of the attack, including information about his journey to India from Pakistan on a boat and the ensuing attacks in Mumbai. “We are minutely assessing what he admitted in court,” he said. Asked by Tahiliyani why he confessed now after consistently denying his role, Kasab said it was because the Pakistani government gave the Indian government a dossier last week acknowledging he was a Pakistani citizen. The dossier also contained information about Pakistan’s investigation into the attacks, dealing a blow to his defence. “The statements are one-sided and they were made by a person who is under the custody of Indian jail authorities. If he has stood up and given this statement I don’t know under what pressure he was,” he told an Indian television channel, according to the report. Harish Salve, a senior Supreme Court lawyer, similarly questioned if Kasab confessed voluntarily. “I am sorry to play the party spoiler. But I hope he doesn’t come the day after and give it another twist,” he said. Kasab said his confession was not coerced. “There is no pressure on me. I am making the statement of my own will,” he said.